I went on my first diet at age 11. It was in that moment that I had learned as a little girl in order to be loved, I had to be perfect. In the mind of an 11-year-old Filipino-American girl that meant pleasing others, looking “perfect,” and getting “perfect” grades. In that summer, I began to severely restrict my food and exercise heavily. When I got to school, I became shy and quiet, fearful to speak up for fear of not being perfect. In fact, my new way of thinking was validated – when friends and family complimented me on my weight and my good work in class. I began to read countless diet books and severely limiting my food intake. But this restriction was not sustainable for me. In the summer before 8th grade, dad brought home a box full of king-sized chocolate bars. I found I could not contain myself and consumed a bar each day, gaining a significant amount of weight. The feedback I got was hurtful, with relatives and friends saying: “Ay, ang taba!,” (In tagalog: “Wow, she’s fat!”) when they saw me. (Well thanks a lot family!) My weight yo-yoed throughout high school though I managed to keep it down by running constantly. I would turn to food for comfort when I was bored, lonely, or even happy. When I graduated high school, I was a healthy 120 lbs. College was an incredibly difficult transition for me. During this time, my binge eating reached its peak. I had an important relationship that was failing and was coping with a stressful major I did not love. Going to a top-ranked school also meant that I was no longer the smartest person in the class and with the high availability of unhealthy foods at all times of the day, I began to gain weight. I was far from my idea of perfect. From first year to third year, my weight increased 20 lbs – a substantial amount of weight for my 5’1” frame. Using food to cope with the stress, I would binge at night, then restrict my food intake or exercise heavily to “make up for the calories” the next day - only to set myself up for the next binge. I tried many diets to get the weight off but to no avail. I felt completely helpless and out-of-control of my life. From there, the binges got more intense and scary. In my 3rd year of college, I started leaving my apartment to get food. In one of my darkest moments, I found myself driving to a nearby fast food joint. As I looked out of my car from the drive through line, I caught a glimpse of some people I knew. In my shame, I ducked down in my car so they would not see me and sped away to the next parking lot with my food. I was then pulled over by a cop, who witnessed the commotion and because he saw me driving with my lights off. Luckily, he let me go; however, I was incredibly shaken and embarrassed. Crying, I called my sister to let her know what I had done. Had I no self control? Why was I doing this to myself? Crying, I called my sister to let her know what I had done. Had I no self control? Why was I doing this to myself? 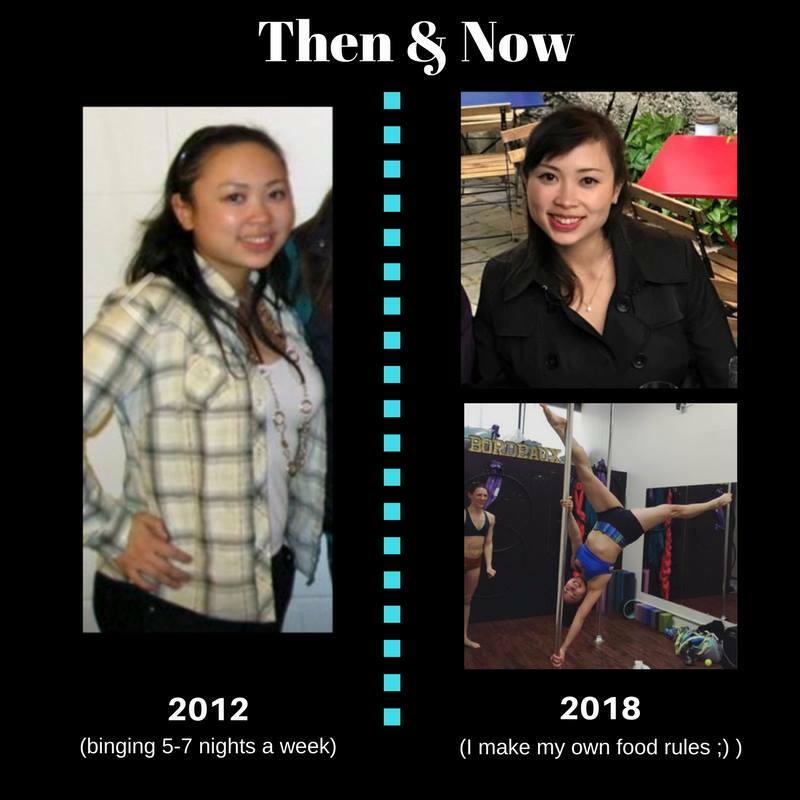 I had tried so many things on my own but because I was so ashamed of the binge eating, I made the mistake of hiding my relationship with food for years. What turned it around was finally reaching out for help. After I graduated, worked with a coach and finally identified internal beliefs that had been weighing me down. I recognized my impossible standard of being “perfect” to other people drove many of my decisions and when I could not reach that standard, I would turn to food. Up until that point I had acted out of fear, outsourcing my worth and decisions other people. Without self-love, I had never gotten in touch with what I valued and therefore did not trust I could make the best decisions for myself. Nowadays, my new belief is that I am perfect exactly as I am. I am much more confident in my decisions and myself. I have ditched all diets (They’re only a temporary fix! ), recognizing and addressing the true reasons I reach for food when I’m not hungry. I am down to a healthy weight effortlessly and am in the best shape of my life (My guilty pleasure being pole dancing!). I have peace with food and peace with myself. When I have cravings when I’m not hungry, I honor them for calling to my attention that my body or my soul is hungry for something else ( whether that be stimulation, companionship, etc). Nowadays, I look back on my emotional eating experiences with compassion. As painful and terrifying as those experiences were, they taught me important lessons. The first was to love and value myself enough to address the root causes of my eating. The second was sensitivity and empathy for other people going through similar experiences. It was through my own experiences that I decided to become a coach. If you relate to any of my story, let me tell you from experience that there are reasons for your disordered eating. If you feel helpless at all, let me assure you that there is hope. It’s not just about the food nor the weight but in tuning into the real reasons why you reach for food when you’re not hungry, I know that you too can find self-healing, self-love, and more peace and satisfaction with your food and yourself. Please if you’re struggling at all with your relationship with food, do not hesitate to reach out to me below. I’m happy to chat with you further and spend some time with you in the “Breakthrough to Food Freedom” session. In this session, we’ll get clear on where you are, where you want to be, and the next steps in healing your relationship with food.